Confused? I pulled these headlines from the Sunday paper that was printed on December 13, 1959, the day I was born. 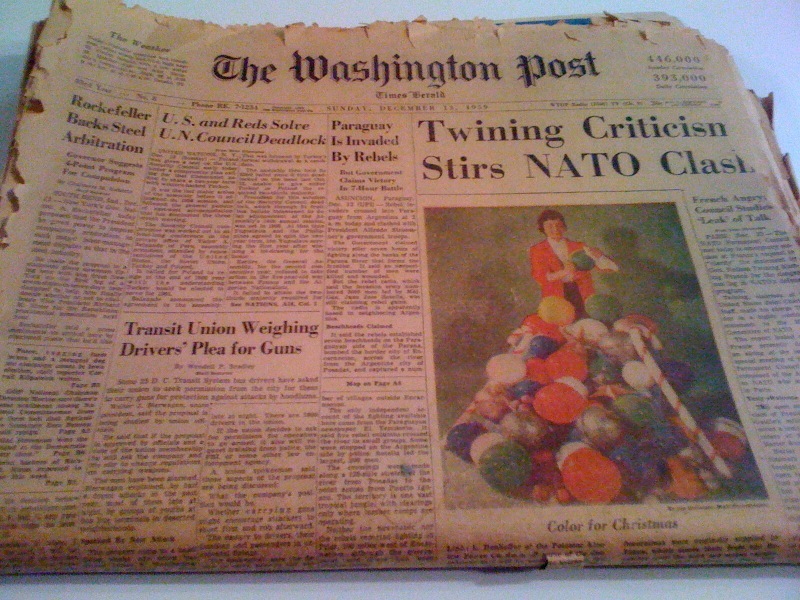 I still have the actual paper my father bought at the Hilton at 16th and K Streets after he dropped my mother off at Georgetown University Hospital. That’s how things were done back then. Fifty-one years later, that newspaper is all yellow and crackly around the edges, as am I. Still, I pull it out every year and marvel at how things have changed—and how they haven’t—since 1959. Debbie Reynolds graced the cover of Parade, while Ann Sothern appeared on the cover of TV Week. One could buy a completely redecorated row house in Georgetown for $28,000 or rent a furnished luxury apartment at 2400 Pennsylvania Avenue for $160 a month. A house in Kensington, Md., where I live, went for $18,900. District residents were enticed to do their shopping at Julius Garfinkel & Co., Woodward & Lothrop, Kann’s, Raleigh Haberdasher, Best & Co., Stein’s, G.C. Murphy Company and People’s Drug. IBM took out a want ad for machine operators, offering complete training in Key Punch and Tab and Wiring. Another company advertised openings for “Ambitious Men (white).” Egads. Before I put away this paper time capsule until next year, I thought you might enjoy a few images. I’m betting many of you recall Washington in the 1950s. Does any of this stir a memory? Let me see, this makes you how old? I certainly remember “for and about women” in the Post — since women obviously couldn’t comprehend the rest of the paper! I think my big night out first date was on the Shoreham Terrace… but not in December! Funny, since I was a little girl, I had always wanted to have my wedding reception on the Terrace. But since we got married in November, we had it in the Shoreham’s Regency Ballroom. Yes! I remember! 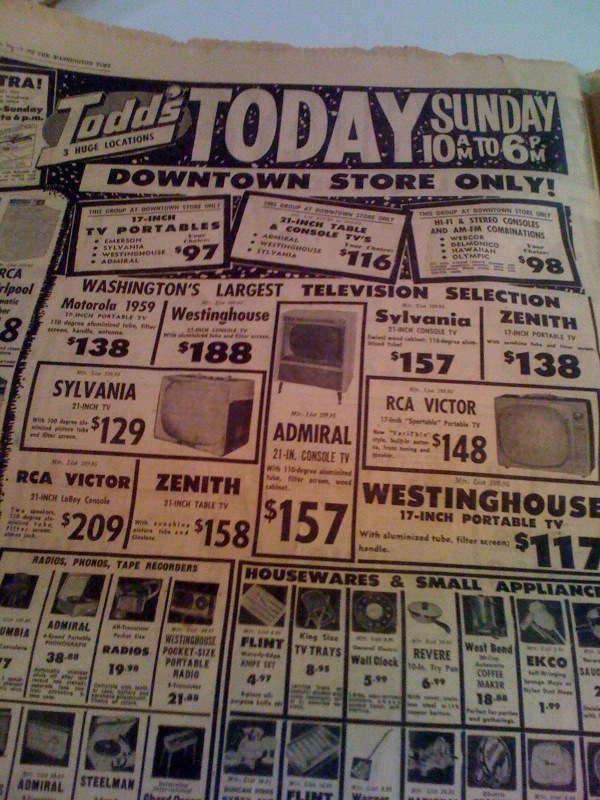 And thanks for sharing this, because I really don’t think I got to read the paper that day! Happy birthday, Monnie! You make me proud. …and you can’t mean it! There’s no more Woodies? Garfinckels? What’s happened on the shopping scene since I left? Happy Birthday, oh Goddess of the Word! I love you! Old newspapers and magazines are the bomb.